January 26, 2009 by rwb, under Microcontroller. 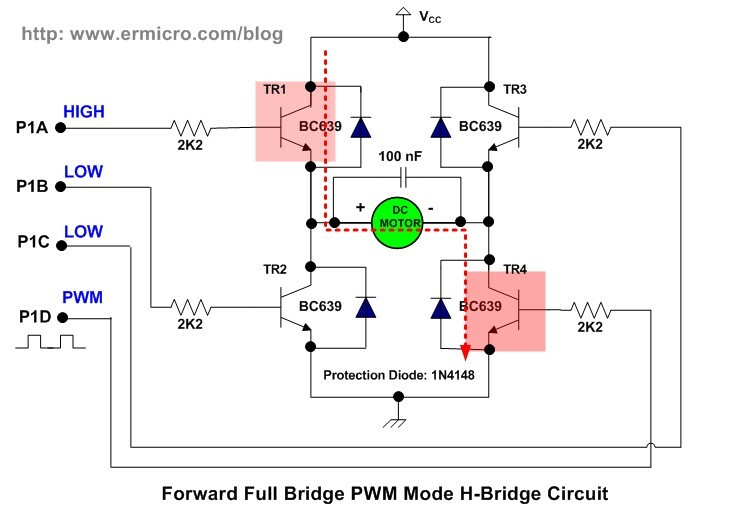 One of the advantages using the Microchip PIC microcontroller Pulse Width Modulation or PWM for short is; this PWM peripheral circuit is designed to control the DC motor using the full bridge mode PWM feature. The PWM peripheral works by supplying the correct signal to the H-Bridge DC motor circuit such as speed controlling and changing the DC motor direction. Therefore on this tutorial we will learn to use this sophisticated feature offered by Microchip PIC PWM. For those with the AVR microcontroller background this is also a good chance to learn the beauty of the different between AVR and PIC microcontroller especially in the PWM peripheral features. The circuit above basically is the H-Bridge transistor circuit which connected to the PIC 16F690 PWM pins through the PIC PWM output ports P1A, P1B, P1C and P1D. 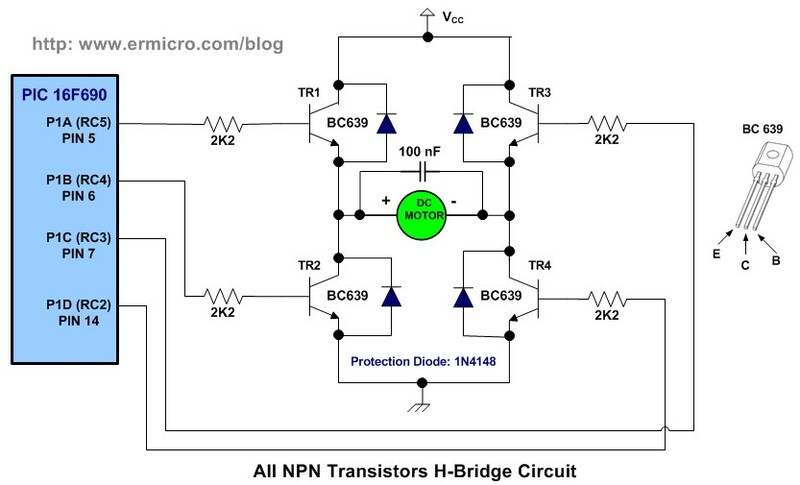 For more detail how the H-Bridge circuit works you could refer to the “Using Transistor as a Switch” posted on this blog. 7. JazzMate 2576-5V power board, the 5 volt switching power supply from ermicro for the H-Bridge circuit. 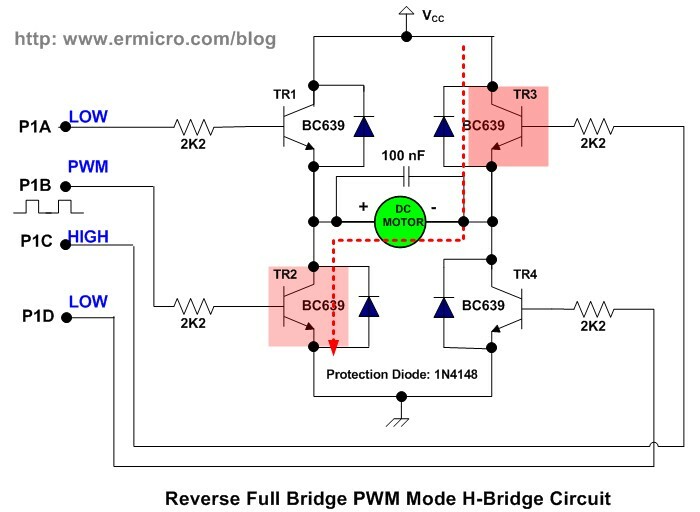 In this tutorial first we will learn how to use the basic single output PWM mode and later on we will use the full bridge PWM mode for controlling the H-Bridge motor circuit. The TMR2 counter register clock is supplied by the prescale circuit which can be selected using the T2CKPS1 and T2CKPS0 bits in the T2CON register, the TMR2 register value is compared to the PR2 register which determine the TOP value of TMR2 counter register. When the TMR2 value is equal to the PR2 value, then the TMR2 counter register will be reset to 0. 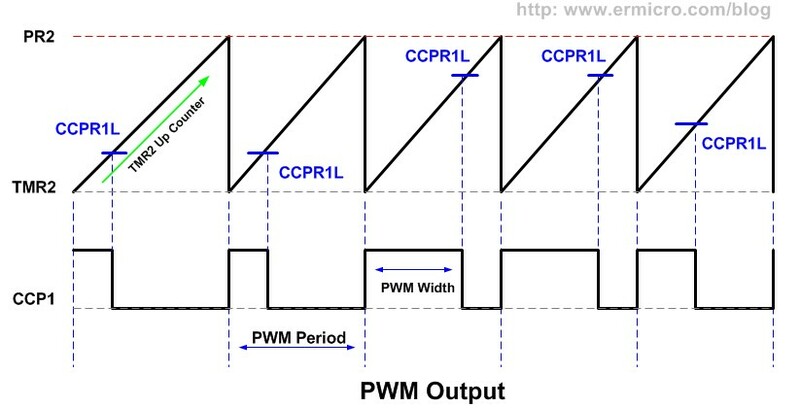 The PWM output behavior is controlled by the CCP1CON, PWM1CON and PSTRCON registers, we will talk about these three registers shortly, but the important think to remember that all the TRIS (three states input/output) register for each of the PWM output ports: P1A, P1B, P1C and P1D should be set to the output mode. This C program basically will use only P1C and P1D PWM output ports, since these ports are attached to the LEDs on the PICJazz 16F690 board. 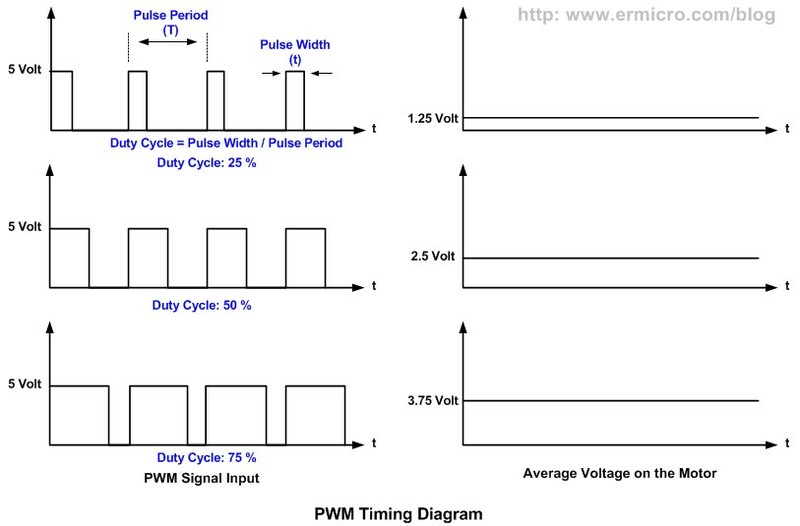 The program will use the PWM pulse steering mode to make these two LEDs to slowly turn to bright and slowly turn to dark by changing the PWM duty cycle. This register is use to select the PWM output configuration bit and PWM mode. This register is used to set the postscale, activate the TIMER2 peripheral and set the prescale clock used by the TMR2 counter register. BY setting the T2CKPS1=0 and T2CKPS0=1 in the T2CON register we select the 1:4 prescale; and by setting the TMR2ON to logical “1” we activate the TIMER2 peripheral. In the single output PWM mode this register is use to control where the PWM ports to be used as the PWM output signal. The steering sync bit (STRSYNC) in the PSTRCON register is set to zero, means the output steering update occur at the beginning of the instruction cycle. The C program begins by selecting the 8 MHz internal clock and setting all the I/O ports used on this examples. After doing the PWM and TIMER2 peripherals setup, we go the endless loop (the for(;;) C statement with no argument); inside this loop we use the CCPR1L register to change the PWM duty cycle by assigning the value from 0 to 255 for turning the LEDs slowly from dark to bright and assigning the CCPR1L register value from 255 to 0 for turning the LEDs from bright to dark. 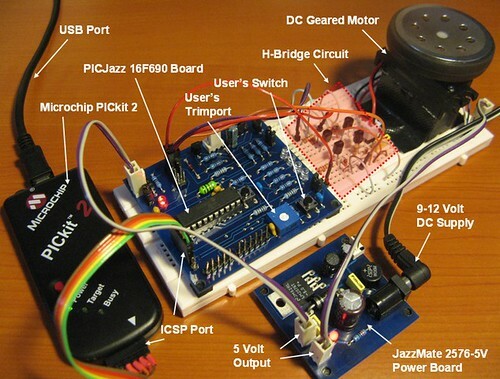 The basic PWM setup routines is almost the same with our previous program, but in this program I used the PIC 16F690 ADC peripheral for adjusting the DC motor speed; the motor speed is depend on the voltage value read by the PIC 16F690 ADC peripheral from the PICJazz 16F690 board user’s trimpot that works as the voltage divider circuit. This value will be assigned to the CCPR1L duty cycle register. 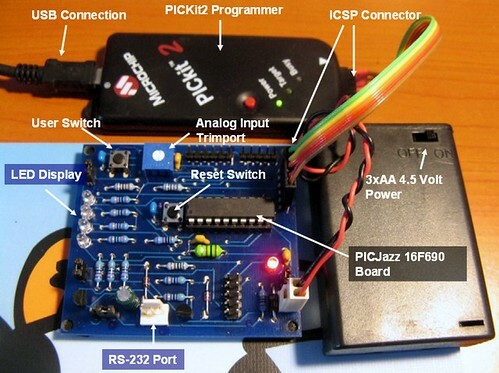 I also use the PICJazz 16F690 user’s switch that works as a toggle switch to change the DC motor direction; and to make it more interesting, I use the LED attached to the RC0 port as the program life beacon; this LED will blink according to the value we assigned to the CCPR1L register. On the forward full bridge PWM mode the TR1 transistor will on saturate and the TR4 transistor will on/off base on the PWM signal supplied by P1D port, while the TR2 and TR3 transistors inactive. The current will flow from TR1 transistor through DC Motor and go to the TR4 transistor, this make the DC motor to turn on the forward direction. On the reverse full bridge PWM mode the TR3 transistor will on saturate and the TR2 transistor will on/off base on the PWM signal supplied by P1B port, while the TR1 and TR4 transistors inactive. The current will flow from TR3 transistor through DC Motor and go to the TR2 transistor, this make the DC motor to turn on the reverse direction. The other register that I mention before is the PWM1CON register (enhanced PWM control register). 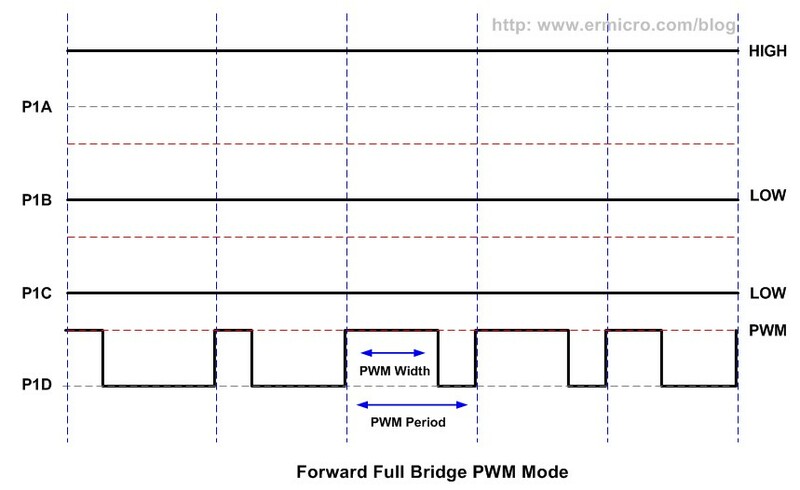 This register is used in half bridge PWM mode to put a time delay to the actual PWM signal transition from zero to active; we are not using this feature on the full bridge PWM mode. The ADC peripheral is used to read the voltage value on the analog input port RA0, this voltage value is supplied by the user’s trimpot on the PICJazz 16F690 board. Adjusting the trimpot means changing the voltage value as well; by converting this voltage value to the digital equivalent value and assign this value to the CCPR1L (duty cycle) register, we could change the PWM duty cycle and this will effecting the DC motor speed. 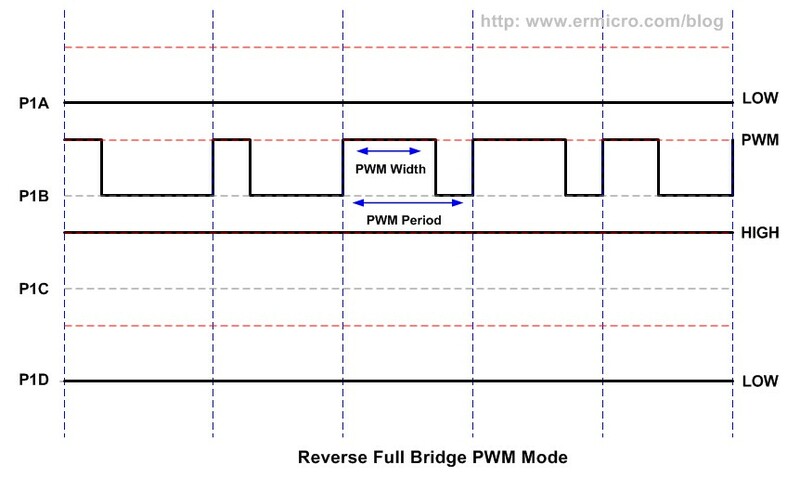 By setting the P1M1=1 and P1M0=1 bits in the CCP1CON register, we select the reverse full bridge PWM mode; setting the P1M1=0 and P1M0=1 bits in the CCP1CON register, we select the forward full bridge PWM mode. The PIC ADC peripheral than read the analog input channel 0 (RA0) port and assigned the value to the CCPR1L register and as the _delay_ms() function argument to the life beacon LED attached to the output port RC0. Yes, just use state machine algorithm; on the first power up the state is 0 and the DC motor is Off. any change in the RA1 input condition (RA1=0 or RA1=1) will change the state to 1, which mean the DC motor is On. I would like to ask if there is any motor driver or motor driver circuit that can receive analogue +-12V input voltage and produce relevant output voltage (with current amplified). Please advice, thank you very much. Yes is possible, basically the circuit has to shift the input voltage to the positive level and trim it to 0-5 volt variation so it can be processed by the microcontroller. I am sorry I forget to mention the target processor I am using is not a microcontroller, it is a microbox which can receive and produce voltage of up to 12V. So, I just want to know if there is any motor driver or motor driver circuit which can handle this voltage range (because if I am not wrong, the L293D can only sustain voltage variation of not more than 5V, right?) Please advice, thank you very much. The L293D maximum logic level input (Vi) and enable (Ve) voltage is 7 volt, the logic supply voltage is 36 volt, and the motor supply voltage is 36 volt, therefore you just need to use the voltage divider circuit to trim the microbox output (i.e. 12 volt) down bellow 7 volt. What is the logic supply voltage for, is it the supply voltage for the chip? Previously, I use this motor driver to access digital input and output via microcontroller. But this time I am using it for analogue input and output. What is the changes that I should make. The output of the microbox should go to enable pin or input pin?? Thank you very much. Yes, the Vss pin is used to supply the motor controller logic inside the chip and the Vs pin is used for supply the motor. All the logical input is not an analog, they are all digital. Usually the enable pins (i.e. ENABLE1 and ENABLE2) are used to control the motor speed by supplying the PWM signal on it and the other logical pins (i.e. IN1,IN2,IN3, and IN4) are used to control the motor direction. If the analog is used to control the motor speed, then you have to convert the analog signal to the PWM signal in order to used it with L293D. I have a doubt. If the microbox I am using can only produce one anologue output to control one DC motor, how am I going to control the rotating direction of the motor using normal motor driver chips? What is the difference between supplying a +12V signal and -12V signal to the motor. Will the motor direction be reversed via this way without inverting the terminal connection of the motor? I am asking this because the microbox I am using will be working with the matlab simulink in PC and the project I am doing is a closed loop control system. In the closed loop control, if the set point is less than the process variable, the manipulated signal will become negative, so as to the output signal. Please advice. Your assistance is much appreciated. Thank you very much. If you plan to use +12V and -12V supply then you could try to use the half bridge DC motor driver circuit. I am sorry, I have made a mistake here. The maximum analogue voltage that can be generated from the microbox is +-10V instead of 12V, so as to the maximum analogue input voltage that can be sustained by the microbox. You need to study the half bridge circuit! Basically this circuit required a symmetric power supply (i.e. +V, GND, and -V) in order to change the DC motor direction (i.e. forward and reverse). Hi….I am again here asking some doughts….. This program at stat up if we make to use state machine algorithm; on the first power up the state is 0 and the DC motor is Off. any change in the RA1 input condition (RA1=0 or RA1=1) will change the state to 1, which mean the DC motor is On. At running I want Stop possition…. and Ra2== 0 for revese…. Can u tell the code modifications…..
RA1 == 0 and RA2 == 1 is forwd..
RA1 == 1 and RA2 == 0 is reverse…. RA1 == 1 and RA2 == 1 is stop. RA1 == 0 and RA2 == 0 is stop. Can u say the code modicications…. As per your advice,I try to edit and compile the code This…. When I am trying this…Giving error message..So can u edit and post the full code for this function. The code is called “pseudo code”, which mean its only show you the program logic not a real C code. You have to make your own code when you want to modify this project C code. I need the stop mode…. You could simply assign the duty cycle on CCPR1L register to 0 to stop the motor. I am confusing this stage.Really…. when the control at level of full speed…. when change the switch to Stop possition…I need stop…. Please explain abt stop .. I have this project working ok. But when I pressed the button it changed the direction only once, and never return, also when ajust the pot it’s freeze the LED and stuck there. From Microchip. Where or how could I purchase your Demo and learning board? Thank you so much to reply my questions. I got this worked ok now. To you and your family !!! Hello man, thank you very much for this tutorial !! It’s usefull to advise some code while studying. I’m a beginner and I use the power control module. Have you done anything with this ,or only with CCP? What did you mean by using the “power control module” on Microchip PIC16F690 Microcontroller? Excuse me, there is a power control module at PIC 18F4331… I didn’t notice that you use PIC16F.. But your logic helped me a lot. So I guess you haven’t ever used 18F family? Hi, Thanks to you for your great-tutorial !! Using this 16F690 I want to take three analog value using RA0,RA1,RA2. Now, if RA0>RA1 the voltage will gradually increase from 60-80%. Again if RA0=RA0,RA1 or RA2<=RA0,RA1 the voltage will be 50%. What will be the program? This will works as charger. Please help me….. I am Newer..
Analog value will be taken as input.By PWM the percentage will vary. Which i did not mentioned in the previous..
You could use the C language if condition to change the PWM duty cycle (CCPR1L register) value based on the RA0, RA1, and RA2 analog input. This article show you how to read multiple analog input on PIC16F690 and how to use the analog value to control a servo Basic Servo Motor Controlling with Microchip PIC Microcontroller. I want to take voltage(6v) & current(10mA) value as analog input, according to this analog value I want to change the PWM duty cycle. Please help me, how can i do it….????? The PIC16F690 microcontroller analog input only could handle voltage level start from 0 to 5 volt. Therefore for 6 volt voltage level you need to use the voltage divider circuit and for the current you need to use a current to voltage transducer such as LEM FHS 40-P/SP600. Next based on the ADC reading on both these voltage inputs, you could adjust the PWM duty cycle using the CCPR1L register. 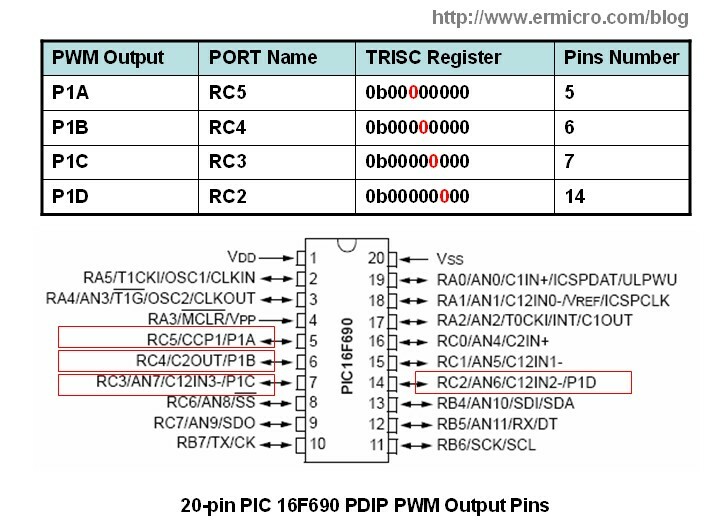 pwm signal again if AN0 value6 then same pin of C-port will create 8V pwm. Some of code given below…. Please complete the code according to my requirement above. I am new in programming. 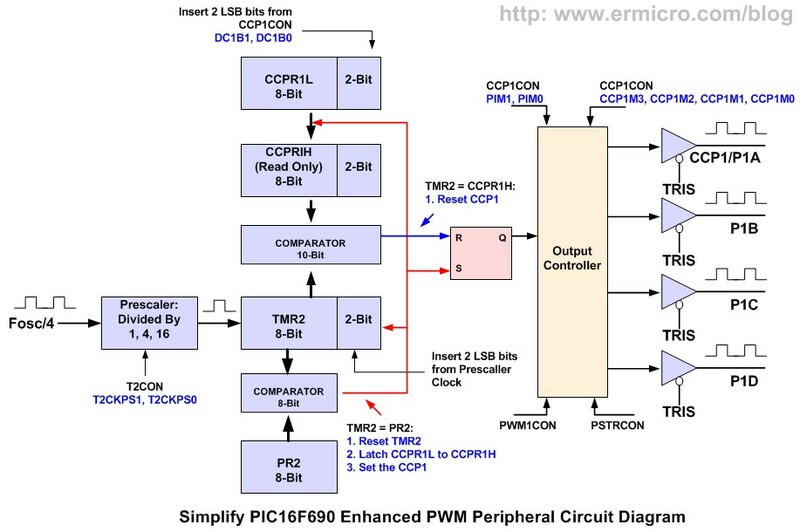 Please, Give me the answer…..
You need to read more about the PWM principle on the Microchip PIC16F690 microcontroller in order to understand how it really work. Remember the PIC16F690 PWM output port will not create 3 volt nor the 8 volt output but it will create a pulse signal from 0 to 5 volt with a duty cycle (HIGH vs LOW) vary from 0 to 100%. It is anyway you can provide me the C code, so i can take a look . Thank you. You could read the article above for the complete C code for this project. Thanks you so very much for your tutorials. I got a lot of knowledge from your blog. Excume me, can you tell me, how to know 2 dc motors position in rectangular coordinates and pls guide me which articles and books I should read. Thank you. You could use the DC motor with the encoder. What is difference between PORTC & TRISC. To show output, have i need to set both(PORTC & TRISC) to Zero(0) or Please tell me details about PORTC & TRISC. Because the PORTC is the bidirectional port (i.e. Input and Output), therefore we need to configure it whether to use it as input or output port. To configure PORTC as the input port you need to set the TRISC (Port C Tri-State) register to 0xFF, while assigning the value of 0x00 to the TRISC register will configure the PORTC as the output port. Basically the joystick has two potentiometers. These two potentiometers will be used two analog ports in PIC microcontroller and use the ADC peripheral to read the analog value. Next use these values to control motor speed (PWM) and direction. thanks a lot for the reply. I have 2 more questions. 1. I am going to use an arduino (atmega328) controller and i have to make sure that i program it and put it on my board is it possible?? i dont want to have 2 seperate boards. 2. Also is it possible for you to provide me with a circuit diagram please?? Hi, I wanted to know if there are any H BRIDGE with 20A as mine is a 300W and 24V DC MOTOR?? Very good tutorial indeed. I need a little more info regarding single output mode. In the single output mode, all the output pins (P1A, P1B, P1C & P1D) will have the same waveform. I need output like – for the first cycle only A and C will be enabled and in the next cycle only B and C will be enabled. This is for full bridge converter. In single output mode, you could use the PSTRCON register to control the P1A, P1B, P1C, and P1D output by enabling the corresponding STRA, STRB, STRC, and STRD bits. please can you provide easy and medium cost project like the 1st project you provide to make line following robot by transistor basis,but it should be more accurate than transistor base one. Yes you could but you need to modify the C program. For the robotics project you could try the “The LM324 Quad Op-Amp Line Follower Robot with Pulse Width Modulation” project.